Every day, people talk about things and events that are happening around them. They may refer to repeated actions such as 'My husband goes to work every day', or to things that are currently happening, such as "He is going to the store". These sentences are all in the present simple tense or the present continuous tense. This free online English course will guide you through these essential English tenses in no time at all. 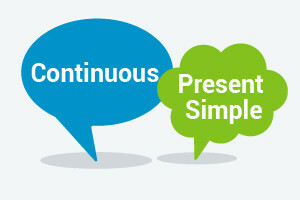 This course will first teach you the essential differences between the Present Simple and Present Continuous Tenses. You will then learn how to use the correct contractions as well as pronouns in question and answer sentences. The course will also teach you to put the correct stress on certain words to help improve your intonation skills. You will learn the rules for spelling continuous verbs as well as study adverbs that can be used with verbs describing actions. Next, you will examine some television programme genres and use these to practice using adjectives to describe things. The elementary level English course will then teach you the purpose of linking words to form faster phrases, just like the way native speakers do, as well as how to distinguish between formal and informal speech. Finally, you will study new vocabulary and grammar rules related to people, events, and protest marches. By taking this elementary level English grammar course and gaining a strong understanding of the English Present Simple And Continuous Tenses, you will notice that other English grammar rules will become easier to understand. The reading and listening exercises in this course will also be a great help for improving your confidence in English conversations with fluent or native English speakers. So, have a look at the course now, and start learning important English verb tenses today. After completing this course you will be able to: Illustrate the difference between the Present simple and Present continuous tenses. Use the correct contractions and pronouns in question and answer sentences. Demonstrate how to put the correct stress on certain words to improve intonation skills. List the rules for spelling continuous verbs. Give some examples of adverbs for use with verbs describing actions. Present some television programme genres and explain how adjectives are used to describe things. Justify the purpose of linking words to form faster phrases. Distinguish between formal and informal speech. Be able to give examples. Highlight some important vocabulary relating to protest marches.